← Plant Tomatoes DEEP in Full Sun! Planting Annuals, A beginning Gardener’s Guide. ANNUALS are plants that grow for one season and die. In about a 7 month period, the annual goes from being seed, to forming into a plant that produces many flowers. The flowers mature on that plant, dry up, and turn into seeds. After the flower and seed producing period is over, the plant dies. Buying Annuals …Annuals can be purchased in 6 packs. A 6 pack is a plastic device which has 6 individual cells. Each one of the six cells is home to one plant. Six packs are always 6 of the same kind of plant, though the 6 plant may be a variety of colors. Annuals can also come planted 6 plants in one plastic box. Larger specimens of annuals can be bought singularly. Whatever way you buy them is fine. Planting Annuals …When you get your annuals home, and go to take them out of their plastic containers, you might be surprised how their root systems look. Your annuals might look nice and healthy above ground, but their root systems might have been tortured by being cramped in those little cells too long. Without much space to move around, the annual’s roots can become root bound. The roots, instead of growing out from the plant, grow around and around, and even inward. When you go to pull one of the annuals from its cell, you might think it was glued in there. (see illustration 1). Your objective is to loosen up those roots, so they will grow outward. Take your fingers and gently try to pry open the bottom of the root mass. If it is really tight around the bottom of the annual, you might even have to rip some of the bottom of the root system off. Don’t worry, you are not hurting the plant! (see illustration 2). When you go to plant your annual, try to match up its soil level with the soil in your garden. You can plant it a little deeper, but not more than 1/2 inch. If you plant it too deep, it will suffocate and die. A lot of people pick the wrong annuals for their gardens. If you have a sunny garden, pick sun lovers. If you have shade pick annuals that prefer shade. Don’t buy annuals that you think are pretty and try to force them to live in conditions they don’t like. Too much sun will burn and shrivel shade lovers. Too much shade will make sun lovers not want to flower. Look at illustration 3. It shows the different light conditions a plant likes. This kind of light chart is on most/all plant tags when you buy annuals. 3A …The full yellow sun is 6 plus hours of direct sun each day. Think south-west exposure from 11AM to 4PM. 3B …is full sun to partial shade. That could be full sun from 6AM until about 11AM. This is like a garden with an eastern exposure planted by a house. 3C …is partial shade to full shade. This is shaded areas on the north side of a house, behind big bushes, or under trees, where light is filtered. Full Shade is a tricky one. No plant really wants/can survive in the complete absence of light. If you think about the deep woods, not many plants grow under the trees. All plants need some kind of light, even reflected light to keep living. Dead Heading Annuals …To keep annuals flowering, you must dead head them. That means cut off Spent (wilted old flowers). By dead heading annuals, you will be tricking the plant into thinking it did not produce seeds. It will send up more flowers hoping to complete the seed producing cycle. Finally, Fertilize your annuals with an all-purpose granular fertilizer like Espoma Plant-Tone, or mix up a liquid like Miracle Grow. If you plant annuals in containers feed them every two weeks with a liquid fertilizer like Miracle Grow. Follow the directions for mixing up the product. Don’t up the amount, it will burn your plants. Every time you water your container plants, you are washing nutrients out of the soil that the plants needs. The Miracle Grow will keep your annuals happy. Think of it this way…How many cups of tea can you get from one tea bag? 1, 2, 3? A too many times used tea bag, is like soil that has all of its nutrients washed out of it. There is no flavor anymore. So go out and plant your annuals. After loosening the roots and planting the first one you will be a pro. Companion Posts …How to Plant (Design) a garden. 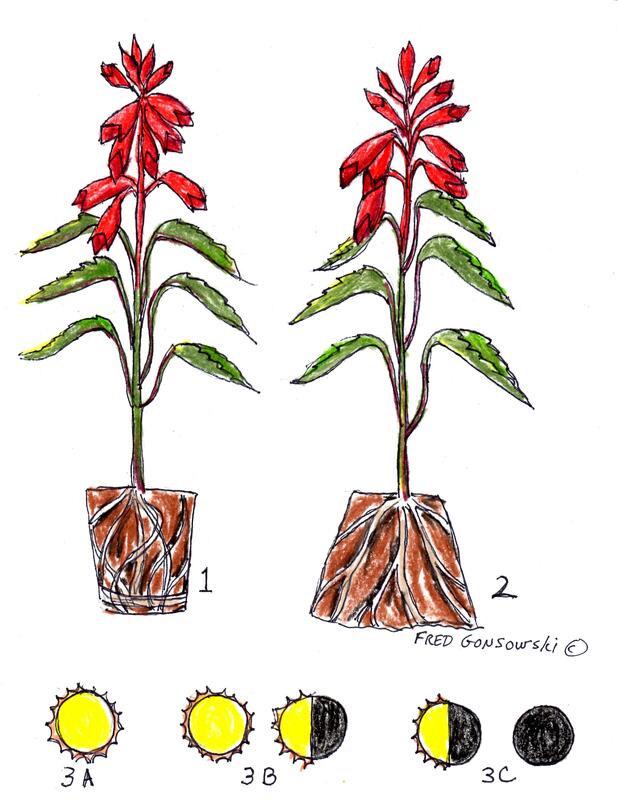 Mass versus Specimen planting. 2-17-2011 ,When designing a perennial garden, it is all about the Shapes of leaves. 1-15-2011 ,Colored foliage adds that WOW factor to a garden. 2-22-2011. This entry was posted in Plant Tomatoes / Raspberries, planting a SHADE GARDEN, The Spring Garden. Bookmark the permalink.